Young ladies are kicking soccer balls, kids are laughing while they hoist themselves into the end zone, mothers and fathers are on the sidelines cheering on their kids, and coaches are on the field well coaching. It’s a joyous day for the City of Inglewood celebrating the renovation of Champions Field, a multi-purpose sports field, at Edward Vincent Jr. Park designated for youth leagues to practice, which the City funded. In a time when many extracurricular programs like sports, the arts, and after-school programs are being cut as a result of budgetary issues, Inglewood Mayor James T. Butts is reassuring the community that these programs and the youth in the community are a priority. The wait is over and to officially open the new field, the city of Inglewood invited the Inglewood Jr. All-American Football league to host an exhibition game, a 7-on-7 scrimmage. 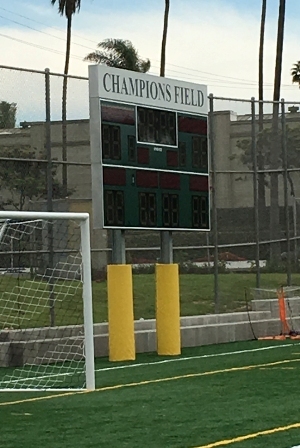 The field features new artificial turf, lights surrounding the enclosed practice facility and enough space for all 12 teams in the Inglewood league to practice at the same time if they chose to. “The field is nice, I wish we could play on it every day,” 10-year-old Jalen Romero exclaimed. Romero has been playing for the Inglewood Jets for the past four years. His dad and younger brother stood on the sideline watching intently as Romero caught a touchdown. There were more coaches, parents and representatives from the city of Inglewood than there were children showing support at the opening event. A concern pointed out by Jason Romero, Jalen Romero’s dad, was the lack of lights at the practice facility prior to the renovation, which made it difficult to conduct evening practices. “It’s good to see that the city is putting some money back into the youth,” said Romero. He was equally thrilled to see the Chargers organization showing their support. 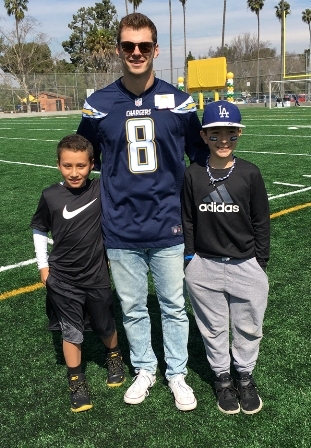 “Having the Chargers player to represent the team shows [the kids] that anything is obtainable and if they work hard, focus in the classroom, they can achieve anything they want,” said Romero. Kaser echoed those sentiments adding that being there gave just as much joy to him as it did to the kids. “It’s awesome to be reminded of the past and the love of the game that kids have; it reminds us of what we play for,” said Kaser. Kaser was not the only NFL representative in attendance. 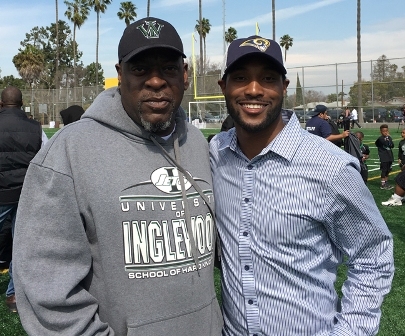 Former NFL running back, Johnathan Franklin, was also there representing the other new team on the block, the Los Angeles Rams, where he works in Community and External Affairs division. Ironically, Franklin is an alumnus of the Inglewood Jets. He remembers practicing at Edward Vincent Jr. Park years ago. It is a full circle moment for Franklin who attributes much of his success on and off the field to football and the mentors he gained along the way. “I believe the game of football is such a powerful sport. It teaches you leadership skills, it helps you understand humility and overcoming challenges,” said Franklin. The Los Angeles native is no stranger to overcoming challenges. In his first season after being drafted by the Green Bay Packers out of UCLA, he suffered a spinal contusion and elected early retirement from football. For Franklin, dreaming beyond was taking what he learned from his time played on the Inglewood Jets to his last snap in the NFL and translating that into a career in sports on the corporate side. Jalen Romero may just become the next Marshawn Lynch as he self-proclaimed or Johnathan Franklin with the support of the Inglewood Jr. All-American football league, his family and the city of Inglewood.